The CompM2 is compatible with all generations night vision devices but is otherwise identical in construction to the CompML2. At the lowest brightness setting (for night-time use with NVD) there is no need for an off position on the switch. No sight on the market can rival the light transmission through an Aimpoint sight in both the visible and IR ranges/spectra. This becomes especially obvious in dim conditions. 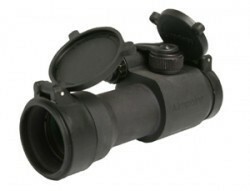 The CompM2 has 4 NVD settings to give an extremely clear reticle in dark conditions.